Ok, let’s see another strange behavior that you might have already seen with the WPF databinding engine. And the goal is to display 3 TextBoxes all databound to the same property. 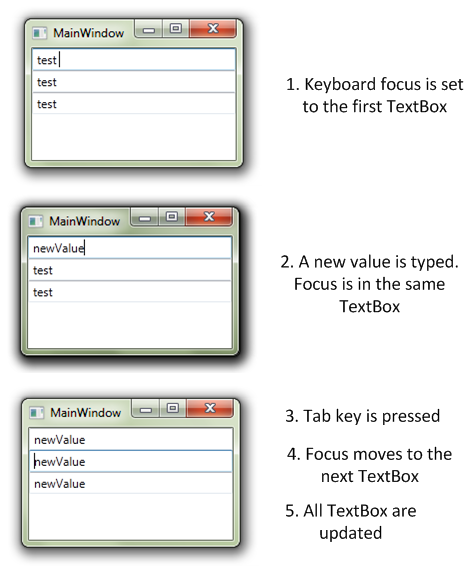 Now, we run the application, types some text in one of the TextBox and change the focus in order to update the binding. Most of us would expect to have the 2 other Textboxes with the old value: when the focus has been lost the new string value has been pushed into the Data property, but the other Textboxes have no way to detect this change. a BindingExpression is created. The BindingExpression is a IWeakEventListener. So there are no miracle behind the demo application I was talking about, just the fact the binding engine is smart enough to cache the PropertyDescriptor used for setting value to CLR property and using the ValueChanged event to get notifications if the source does not implement INotifyPropertyChanged. According to Pete Brown not using INP causes CPU and memory performance and usage penalty (both significant and measurable). Thanks for the feedback and sharing you links !